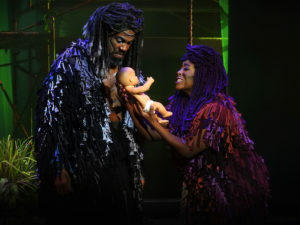 Slow Burn Theatre Company’s production of the musical Tarzan swings into the Broward Center for the Performing Arts. Featuring music by Phil Collins and a book by David Henry Hwang, the musical Tarzan is based on the 1999 Walt Disney Animation Studios film of the same name. The musical follows the plot of the Disney film, with a few minor changes. Terk, who was a female in the film, is a male in the musical, and the major character of Tantor the elephant is completely cut from the musical. Both the musical and the film are based on the character of Tarzan as presented in the series of twenty-four Tarzan adventure novels written by Edgar Rice Burroughs. (followed by several novels either co-written by Burroughs, or officially authorized by his estate). The series is considered a classic of literature; and Tarzan has been called one of the best-known literary characters in the world. Written by Burroughs between 1912 and 1965, Tarzan has been adapted many times, complete or in part, for radio, television, stage, and cinema. The musical tells the story of John Clayton III. In 1888, the infant Clayton and his parents, Lord and Lady Greystoke of England, are marooned in the western coastal jungles of equatorial Africa. He is left orphaned before his first birthday when both his parents die. Against the wishes of the king ape Kerchak, he is adopted by she-ape Kala, and named “Tarzan” which means “White Skin”. Raised by gorillas, Tarzan comes in no contact with other humans until he meets Jane, a young English naturalist come to explore and document the flora and wild life. Jane and Tarzan fall in love, and all seems promising until complication arise when members of Jane’s expedition plan to capture and exploit Tarzan and the gorillas for financial profit. They are ruthless enough to kill any man or beast who would get in their way. Tarzan and Jane must find their way out of the perilous situation and agree upon a way that they can be together in the complicated world in which they find themselves. This Slow Burn production of Tarzan features a live, seven-piece band led by music director Eric Alsford. The blend between musicians and singers is flawless, and the sound created by the size of the band is perfect for this show in this space. Though based on an established, well-known character, the musical itself does not have the solid structure one might expect. The music itself is lacking in complexity and development, and there is a lax integration of the story with the score in an attempt to produce organically born moments of song. In the end, it is after all a Disney show written by a pop singer however, so it has a cache of it’s own. The simple but effective ensemble harmonies to Phil Collins’ songs are well sung by the cast, with the two strongest soloists being Natale Pirotta as Tarzan and Shonda L. Thurman as Kala. More about them later, but first to the scenic elements. Positioned in front of a backlit scrim, long strips of green gauze, suspended from the ceiling, represent the tall trunks of trees. Grouped around them are clusters of umbrellas covered in sheer greens and yellows, positioned to portray the layers of foliage high overhead. A low-lying mist seeps it’s way onto the stage for much of the show. Vine covered platforms provide places from which those characters playing apes can perch and swing, when not assisted by a flying apparatus. Lighting by Thomas Shorrock is at it’s best in this production. The projection of leaf-shaped lights spills across the stage onto the ceiling of the theatre overhead; delightfully inviting the audience into the jungle setting of the show. The show’s use of flying with the use of harnesses generally works quite well. The choreography for the dancers playing apes, clad in assorted outfits made to look like fur, blends well in and out of the flying moments, and add energy and interest to the show. A special nod to Jonathan Eisele as the leopard, who manages to look both graceful and menacing as his masters his mid-air fight choreography while suspended by wires. I did miss the use of flying flowers and bugs in Jane’s opening scene done in other productions. It helps explain how Jane gets stuck aloft in a spider web. This moment was unclear in this production, and many people didn’t know why she was there until the spider started crawling towards her. There is also some lack of clarity in the staging of fight choreography and blocking in a second act scene in which people are caged. Other than that, the show has many surprisingly enjoyable moments. A handsome Natale Pirrotta (Tarzan), sings the role beautifully, makes swinging through the air look like it’s second nature, and has a bit of an innocent quality to his character that works well with Lindey Corey as Jane. Physically Corey may not initially look like what one pictures as Jane, but brings such humor to her portrayal of the character that it is difficult to imagine someone better suited. Her facial reactions ranging from alarm to pleasure during the moments in which she and Tarzan discover one another physically and emotionally are one of my favorite parts of this production. Dante J.L. Murray has a warm baritone sound, and masculine presence as king ape Kerchak. He is matched with the warmth and tenderness of Shonda L. Thurman as she-ape Kala. Thurman does a lovely job singing “You’ll Be In My Heart to the young Tarzan, Christo Joseph Amygdalitsis, who performs as professionally on stage as the adult cast around him. Darius J. Manuel has a fey take on the character of Terk that seems to be a cross between Titus Burgess and Tina Turner. Despite his big voice and big personality, it misses the mark – seeming to be an attempt at a comic gimmick without genuine purpose. Slow Burn Theatre does an admirable job with this production of the musical Tarzan which faced mixed reviews on Broadway due to it’s script. They have risen to the occasion of the use of flying on stage (no easy task for any theatre), and a large dance ensemble. Some of their use of lighting and scenic design is a definite step up from previous productions. It is well worth the trip to see the character of Tarzan brought to life on stage, as he swings overhead and into our hearts. The musical Tarzan began as a workshop in 2004, with Daniel Manche as Young Tarzan, Matthew Morrison as Adult Tarzan, Adam Pascal as Tarzan Storyteller and Laura Bell Bundy as Jane. The Broadway production opened at the Richard Rodgers Theatre on May 10, 2006, where it ran for 35 previews and 486 performances. Though it was nominated for a Tony award for Best Lighting Design of a Musical (Natasha Katz), Tarzan closed on July 8, 2007 due to poor ticket sales. Subsequently, the show has been staged in the U.S. and several other countries by regional theatres. Started in 2009, Slow Burn Theatre Company is a professional theatre company hiring equity and non-equity actors. Their mission is to provide South Florida’s diverse population with opportunities to experience high quality, daring, contemporary and intelligent works of musical theatre through attendance, employment, and/or educational and community outreach programs. For information on Slow Burn Theatre Company, call 954-462-0222, or visit www.slowburntheatre.com. Slow Burn Theatre Company production of Tarzan will be appearing through November 5, 2017, in the Amaturo Theater of the Broward Center for the Performing Arts. Performances are Thursday–Saturday at 7:30 p.m. and Sunday at 2 p.m. with a matinee on Wednesday, October 25 at 1 p.m. Tickets are $47–$60. Tickets are $15 to a special sensory-friendly performance on Saturday, October 28 at 1:00 p.m. Ticketmaster is the only official ticketing service of the Broward Center, Parker Playhouse and affiliated venues. Buy tickets online at BrowardCenter.org or Ticketmaster.com; by phone at 954-462-0222 or the Broward Center’s AutoNation Box Office. The Broward Center for the Performing Arts is located in the Riverwalk Arts & Entertainment District at 201 SW Fifth Avenue in Fort Lauderdale. *Indicates a member of Actors’ Equity Association, the union of professional stage actors and stage managers in the United States.